Following drought conditions that presented challenges to crop producers across most of the United States in 2012, a recent Columbus Dispatch article shows 2013 marked a significant boost in corn production for Ohio farmers. Thanks to timely rains and favorable growing conditions across much of Ohio in 2013, producers were able to turn out an estimated 631.6 million bushels of corn, representing a 40% increase from 2012. This number is far larger than historical averages, as the article indicates yearly corn production averages from 1964-2012 have historically hovered right around 381.2 million bushels. 2013 was a welcomed sight after drought conditions in 2012 consistently sprawled across two-thirds of Ohio during a five-month span. Farmers looking forward to 2014 believe the year is off to a good start as December rains have likely helped set up the soil for a strong start to 2014 planting. 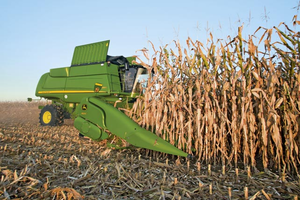 This article shows Ohio corn growers had a very successful year in 2013, increasing corn production by 40% as they now turn their attention to the 2014 planting season.